Darth Krayt's program to exterminate the Mon Calamari is still in progress, with only the Mon Cal Rangers standing between the refugee populace and certain doom. Now a Sith scientist has a new weapon against which the Rangers are powerless. Faced with a choice between allowing refugees to perish and sacrificing themselves in a fruitless delaying action, the Rangers turn to an unexpected-and reluctant-source for help. 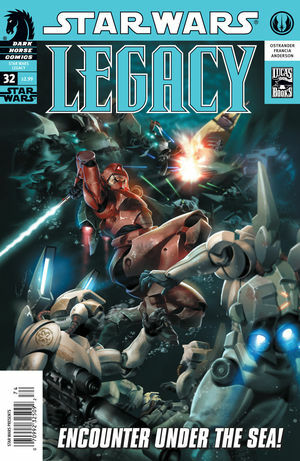 "Star Wars: Legacy took a gamble by jumping the Star Wars saga one hundred years past what we knew about it and it has paid off. It's a great series." Entire contents trademarked (® or ™) and copyrighted (©) 1986-2016 by Dark Horse Comics Inc. and its respective Licensors. Dark Horse, Dark Horse Comics, and the Dark Horse logo are trademarks of Dark Horse Comics, Inc., registered in various categories and countries.